Is it someone’s house warming party? Or maybe just a completion of 10 years together? Do you what is the best thing to gift them? Well, something that stays with them for a while, something that they connect with, something that they will cherish forever! Why not give them the choice to choose their gift altogether and with Pepperfry, gifting is always made easy. Get your loved and dear ones the chance to have something of their own accord for to build a home! The amazing Gift Cards from Pepperfry come to your rescue: Check them out now, get the best deals and offers through GrabOn! A country as diverse as India celebrates multiple festivals. Selecting gifts on all these occasions might get a little taxing. You can get your job done by gifting your loved one's Pepperfry Gift Cards on any occasion that you desire. Available in multiple denominations on Grabon, Pepperfry Gift Vouchers can make for a perfect gift that will allow your friends and family the flexibility to purchase what they want and need. Save more with GrabOn coupons while purchasing! Gift Cards are always the most delightful and flexible gift. Pepperfry eGift Cards can help you save time looking for the perfect gift and help you spend more time with your dear ones. Pepperfry offers a huge range of furniture, home decor, and home essentials that is just what makes your home look perfect and trendy. With Pepperfry Gift Cards, your friends and family can doll up their house with the decor of their choice and praise you forever for the gift. Pepperfry is present in 22 cities so it's easier to send gifts to ones who aren't in the same city. Whether it's your best friend's birthday or your parent's wedding anniversary, or your colleague's wedding, Pepperfry eGift Cards are the best gift to help them build a house of their dreams. The passion with which people decorate their homes shows their love for the abode. Gift them the flexibility to choose everything pretty! What are you waiting for? Get a Pepperfry Gift Voucher only from GrabOn. What can I buy with Pepperfry Gift Card? Pepperfry is one of the largest online furniture studios that offers trendy home decor and furniture for you to redo the setting of your house. You can choose from a wide range of Sofa sets, Bed, Mattress, living room furniture, kids furniture, office essentials, kitchenware, lights & lamps, carpets, bathroom essentials, carpets, wall art, interior decoration items, Bar furniture, garden & gallery decor, and a lot more. You can also get expert advice on how to decorate your house from Pepperfry experts. Made up your mind to get the Gift Card? Perfect! Go to Grabon and select Pepperfry Gift Card. You can use vouchers available while making the payment. Other than the gift vouchers, GrabOn also helps you save maximum on your purchase by offering exclusive deals and offers on products. Send your loved ones some love or maybe, pamper yourself and get a comfy bean bag for your room. It's time to show love! How to add a Gift Card to Pepperfry? If the cart value is less than the Gift Card value, the amount will be deducted and the remaining amount will be left in your Gift Card. However, in case the amount exceeds, you will have to pay the additional amount. 1. What can I do with a Pepperfry Gift Card? You can purchase a Gift Card from Pepperfry and gift it to your dear ones on special occasions. Gift Cards are in trend now because of their easy usability and long validity. Plus, it makes for a perfect gift as your friends and family can choose their gifts according to their choices and need. They can use the Gift Card to purchase from over 100,000 products available on Pepperfry. 2. How can I buy a Pepperfry Gift Card on GrabOn? Finally, proceed to Checkout and make the payment. You can pay via credit card/ debit card/ Net- banking. The Pepperfry gift card will be sent to the recipient once your payment transaction is complete. 3. How can I redeem my Gift card and can I use multiple Gift Cards in a single purchase? No, you cannot redeem multiple gift cards in one purchase. To redeem your Gift Cards, you can visit any Pepperfry store or the website, select the products you want to purchase and checkout to pay. In the payment option, choose Gift Card, enter the code and PIN. 4. Can I club other running discounts with Gift Card? Yes, you can avail other running discounts when you redeem your Gift Card. 5. What do I do if the transaction fails but the amount gets deducted or if I cancel my purchase? In such a case, reach out to us as soon as possible. Our team will investigate the matter and take actions accordingly. To reach us, you can drop us a mail at giftcards@grabon.in or call us at 7997692233 and our team will get back to you. 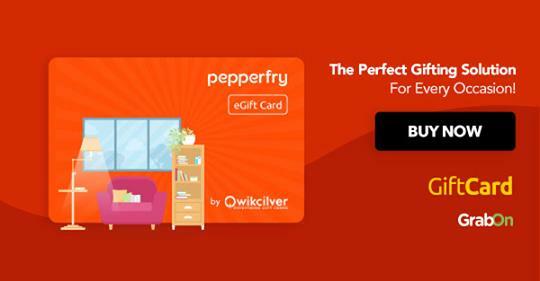 Pepperfry Gift Card(s) (referred to as “Pepperfry GCs" or Pepperfry GCs) are issued by Qwikcilver Solutions Pvt. Ltd. ("Qwikcilver") , a private limited company incorporated under the laws of India, and is authorized by the Reserve Bank of India ("RBI") to issue such Gift Cards. 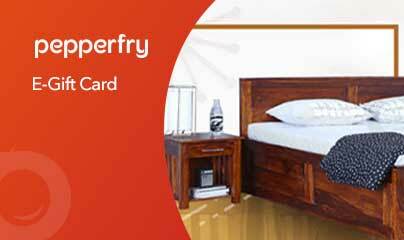 The Pepperfry Gift Cards (Pepperfry GCs) so issued can be used for any purchase listed on www.pepperfry.com. Pepperfry GCs will be valid for a period of 1 (One) year from the Date of Issue of Pepperfry GCs. Pepperfry GCs can be redeemed by selecting the payment mode ”Pepperfry Gift Card”. Pepperfry GCs cannot be redeemed on Pepperfry Mobile App. No cash withdrawal is permissible against the Pepperfry GCs. Pepperfry GCs cannot be used to purchase other Pepperfry Gift Cards, if any. If the order value exceeds the Pepperfry GCs amount, the balance must be paid by Credit Card/Debit Card/Internet Banking/Wallets. Cash Pay, Part Pay and COD cannot be used to pay the balance amount. If the order value is less than the amount of the Pepperfry GVs, the outstanding balance (after deduction of order value) will reflect under the same Pepperfry GCs and can be used for subsequent transactions till its validity. In case the Order is cancelled by the Customer within the timeframe as mentioned in the Cancellation Policy, wherein the Customer has redeemed the Pepperfry GCs, in such scenario the Customers’ Pepperfry GCs shall be credited with the amount equivalent to the redemption amount. Once the Pepperfry GCs has been sent to you, you are bound to protect the Pepperfry GCs PIN or Gift Card number as confidential. In the event of any misuse of Pepperfry Gift Cards due to loss of any such confidential details due to the fault of the purchaser, Qwikcilver, Trendsutra Platform Services Private Limited (Pepperfry.com) or their affiliates shall not be responsible for the same and no refund can be issued. Qwikcilver/ Pepperfry.com reserves the right to cancel the Pepperfry GCs if the same have been found to be purchased with fraudulent means. In such cases, the funds shall be credited back to the same source from where these were received. In the event the beneficiary/Know Your Customer ("KYC") details as per RBI Guidelines are found to be incorrect/insufficient, Pepperfry.com /Qwikcilver retain the right to cancel the Pepperfry GCs so issued.